Peirce has long been an innovator in higher education. 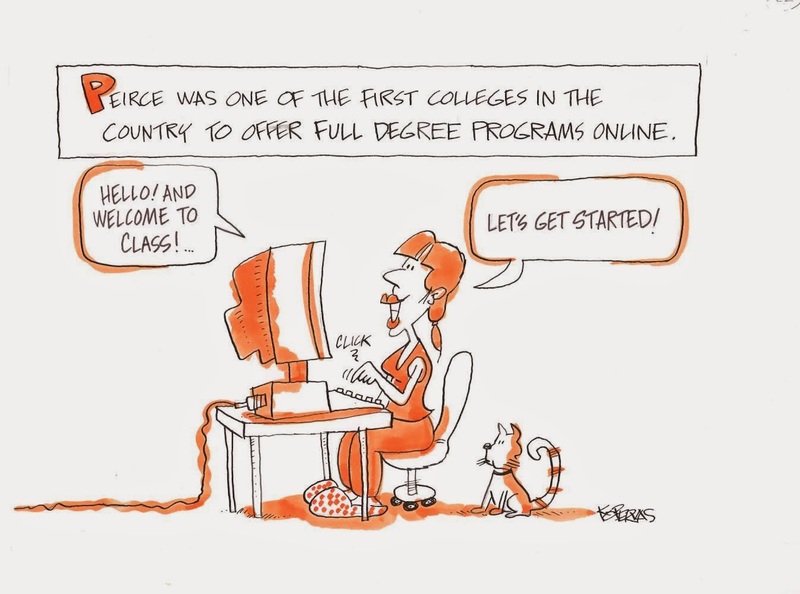 From preparing returning Civil War soldiers for a business focused education, to innovative courses to help supply the workforce during WWI, to being an early adopter in online education, Peirce prides itself in being a pioneer and early adopter. As we celebrate our 150 year history of innovation, we’re continuously striving to stay on the cutting edge of providing working adults with the education they need to compete in today’s workforce in the most up-to-date formats. At Peirce, we understand that earning a college degree requires an enormous amount of commitment and dedication. Students invest both financially and emotionally in pursuit of their degree. Most Peirce students have one or more jobs and balance the demands of family or other caregiver responsibilities. Traditionally, the College has offered courses in two formats; online and on campus. While these formats of instruction are commonplace in higher education, they offer the student little, if any, flexibility within a single course. In other words, our on campus students are committed to attending class on campus for a full seven or eight weeks and our online students must commit to attending class online for seven or eight weeks. Regardless of the format the student chooses, there are limitations in terms of flexibility for either student. If our on campus students must miss a class, there is no make-up option. If our online students want to come to class on campus for a week or two for a face-to-face experience, that option is not available for them either. From a scheduling perspective, students must enroll in classes when they are offered and in their format of choice. That is … until now. Peirce is committed to taking course delivery and instruction to the next level in order to meet the needs of today’s learner. We are doing so by introducing our intracourse delivery option. Beginning in fall 2015, Graduate Studies and Health Programs courses will be offered in Peirce’s flexible intracourse delivery format. Other degree programs will convert to this model by fall 2016. This instructional delivery model offers students the flexibility of choosing on a weekly basis how they will participate in a course: on campus, completely online, or a mix of both throughout the duration of a course. In addition, the College is expanding its use of instructional technology in the classroom and exploring creative means of delivering instruction such as the flipped classroom. In general terms, the flipped classroom is one marked by students doing class preparation at home such that face-to-face class time focuses on application of the ideas the student prepped for. Peirce is leveraging innovation in higher education guided by a very strong strategic plan and a dedicated faculty team led by Dr. Rita Toliver-Roberts. Dr. Roberts’s vision for teaching and learning excellence is guiding the implementation of our intracourse delivery model and other strategic initiatives impacting instruction at the College. We look forward to continuing our tradition of innovation as we continue to serve the needs of adult learners over the next 150 years.